I have the t CL Error Code on my LG Washer. I was washing clothes and I noticed the washer was not working and the display showed the tcL Error Code. Can you tell me what this error code refers to? I am at a loss as to what to do. My LG washer is 2 years old, was around $1000 US dollars, and the model number is WM1814CW. I have tried to unplug the washer as stated on some other websites, but unplugging the washer did not reset the error code. Please advise me on how to clear or reset the LG washer to remove the t CL error code. If your LG front load washing machine is showing the t CL error code, this is telling you to run the tub clean cycle. This means the washer is sensing that the tub is not clean and needs to be properly cleaned to function at peak performance. There is a sensor in the washer that senses the tub is dirty. This sends a signal to the display panel where it shows the error code. 2 – Next, apply your choice of cleaner such as recommended: Liquid Bleach (Tub Clean Solution) – Powder Tub Clean – Tablet (pod) Tub Cleaner. 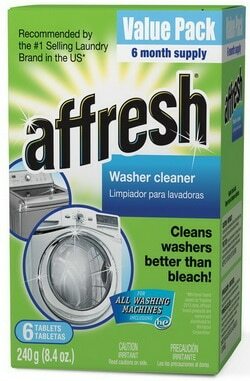 All Washing Machine Cleaners here. NOTE A: If you are using Liquid Bleach or Tub Clean Solution, add it into the compartment that says LIQUID BLEACH. NOTE C: If you are using a Tablet Cleaner, add the Tablet directly into the washer. Do not add Tablet Cleaner into Detergent Dispenser. Do not add anything else. 3 – Once the cleaner is in the right place, go to the LG washer control panel, Turn Power Button to ON – Select the TUB CLEAN CYCLE – Press START Button. 4 – Let the washer run and complete the TUB CLEAN CYCLE. After running the TUB CLEAN CYCLE you will be able to wash clothing without the code showing in most cases. 5 – If the error code reappears, run the TUB CLEAN CYCLE once more to fully CLEAN the tub. 6 – The t CL error may continue to show after completing multiple wash cycles but will clear with the next “scheduled” washer tub clean cycle. TIP 1 – To keep your washer running smooth and as designed, use the TUB CLEAN CYCLE once per month to keep your LG washing machine clean and free of detergent build up. TIP 2 – Wipe the inside of the door and the door seal to remove moisture after washing. TIP 3 – Leave the washing machine door open to allow the tub to dry so no odors can build up. TIP 4 – If you find your washer has odors, use the TUB CLEAN CYCLE to remove any odors that can occur with washing. TIP 5 – Run the TUB CLEAN 3 times in a row to remove heavy odors or if error code reappears. 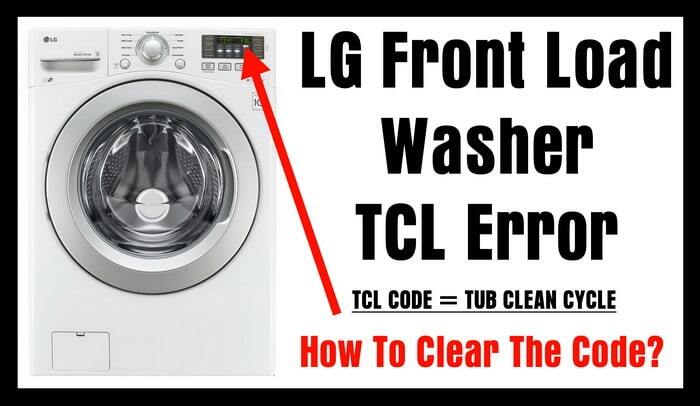 Here is a video below that will show you how to run a TUB CLEAN CYCLE on your LG WASHER to CLEAR THE TCL ERROR CODE. Cleaning the LG washer tub every month using the TUB CLEAN feature can help to minimize odors. Running the TUB CLEAN CYCLE on your LG Washer will remove detergent residue buildup and any debris that may have accumulated. Do you have questions or cannot clear the TCL error code on your LG washer? Please leave a comment below and we will be happy to assist you. I’ve been trying to clean the tub of my LG washer dryer combo. I placed a tablet of Affresh into the tub, closed the door, pushed the clean tub cycle pressing it for a few seconds and the tub turned but the water didn’t enter the tub so I stopped. I tried this a few times more. The sane thing happened. I did push the power and start buttons. Is there a delay before the water enters the tub? Now I’m getting dashes when I press the clean tub indicator. Does this mean I can’t clean the tub,etc. because I’ve tried too often? What should I do? Thank you for your help.